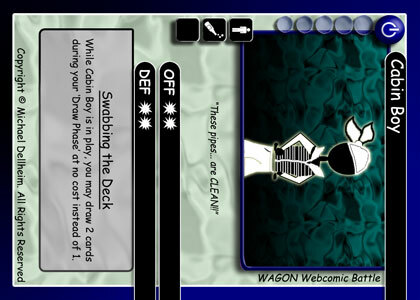 The object of WAGON Webcomic Battle is to defend your Life Panels from your opponent's attacks while trying to destroy their Life Panels. The first player to lose all of their Life Panels loses the game. Boosted Character, or Plot Device in your deck. Boosted Character, or Plot Device in play at one time. Boosted Characters actively in play at once. You may only have up to 5 Plot Devices in play at once. There are individual cards that exist that can bend or break these rules, but most gameplay will be restricted by these limitations so keep this in mind when building your deck. For new players learning how to play we suggest that you use a pre-built deck, which is set up in this fashion automatically. 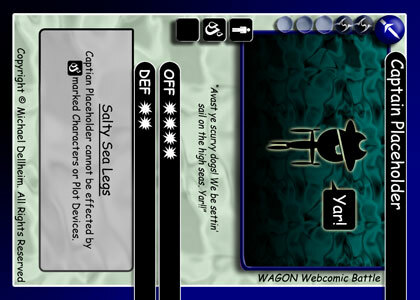 The five cards you lay out in front you face down are your Life Panels, which represent your life meter in the game. If you ever lose all of your Life Panels the game is over. 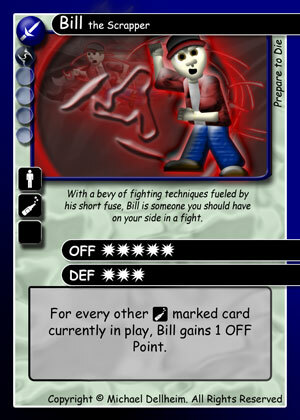 Life Panels can be lost in several ways, but most commonly from attacks by your Opponent's Characters. If you are ever left vulnerable, either by having no Characters on the field or by the creation of an Attack of Opportunity (which will be discribed in detail later), you risk losing one or more Life Panels. Without Characters on the field to defend you, your Opponent's Characters can attack your Life Panels directly and destory them. This is why it is always best to have any Character, even a weak one, on the field whenever possible as they will protect you from harm. You may also lose Life Panels as your Draw Deck runs out; if you ever run out of cards in your Draw Deck, you may draw instead from your Life Panels to continue playing for a few more rounds. Of course, once you draw your last Comic Panel the game is over. The good news in all of this is that whenever one of your Life Panels is destroyed by your Opponent, it is not discarded. The card is added to your hand instead, possibly turning your loss into an opportunity to possibly turn the tables on your Opponent. When it's your turn to play, there are five phases that you take different actions in to Advance counters, Draw cards, Play cards, take Action, and Discard cards. 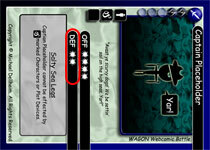 Unless specified by the effects of the card itself, this is the order in which game play will take place. Characters, and most Plot Devices will be put onto the playing field during the 'Play' Phase by you on your own turn. There is an exception to when to play Instant Plot Devices; these cards can only be played during you OR your Opponent's 'Action' Phase. You can learn more about Instant Plot Devices here. Boosted Characters will also be brought into play during the 'Action' Phase, but only your own turn. Please refer to the Boosted Character page to learn more about these special cards. If you have any Counter-type Plot Devices in play reduce their count by 1, and if the counter reaches 0 discard it from the field and into the Discard Pile. 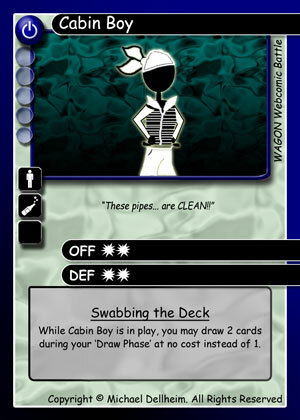 Cards that accumulate counts or tokens every round will also most often be taken care of in this Phase. Draw 1 card from your Draw Deck and add it into your hand. You may also discard Bandwidth Cards in order to draw more cards from your Draw Deck. However, you may not spend generated Bandwidth to draw these cards, you may only use actual Bandwidth Cards. 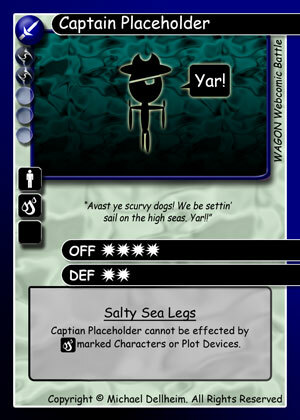 Play Character and non-Instant Plot Device cards. You may play as many cards in 1 turn as you can afford to play, but remember that you are limited to having up to 5 Characters and 5 Plot Devices on the field at any given time. Once all your cards are in play, you may now attack your Opponent's characters, use Plot Device and Character effects, or attack your Opponent's Life Panels either directly or through Attacks of Opportunity. Both you and your Opponent are allowed to play Instant Plot Devices during this phase. This is the ONLY time you are allowed to play Instant Plot Devices. Instead of attacking you may choose to swtich a Character between Offensive or Defensive Position, which we will discuss further on. Note: a Character can not make normal attacks in the same turn as it is played, you must wait until your next turn for them to attack. You can however use a Character's Special Ability right away. You may also play Boosted Characters at this time on your turn, if you meet the rquirements for playing them. Please see the Boosted Character page for more information on how they work. After your action phase is over, you may choose to discard cards from your hand or from the field. Once cards have been discarded, your turn ends. A Character may be played in two ways on the field, in Offensive Position (vertically) or in Defensive Position (horizontally). Depending on the Position you play your Characters in they will have different abilties in gameplay. The most notable difference in these is the use of OFF and DEF Power. Characters in Offensive Posistion use their OFF Power for fighting other Characters. While in Offensive Position a Character can attack other Characters and destroy vulnerable Life Panels. The downside to being in Offensive Position is a Character can leave you open to Attacks of Opportunity when destroyed. In the example to the right, Captain Placeholder has a base OFF Power of 4, meaning that when he attacks or is attacked while in Offensive Position it will take an attack with the Power of 4 or better to destroy him. Similarly, a Character in Defensive Position uses their DEF Power for fighting other Characters. While in Defensive Position a Character cannot make attacks, though they can still use their Special Abiltities. The avantage is that Defending Characters do not create Attacks of Opportunity when they are destroyed. In our example this time, The Captain in Defensive Position only has a DEF Power of 2, meaning he's much easier to destroy... but since he's a Fighter this should come as no suprise as they're usually not very good defenders. Still, a poor defender is always better to none at all! The are two ways to destroy your opponent's Life Panels. One is by destroying all of their Characters so you can attack them directly, which can sometimes be a long and difficult task. The other way is by using Attacks of Opportunity. An Attack of Opporunity allows you to bypass your opponent's defenses and attack a Life Panel while they still have Characters on the field. How is this accomplished, you ask? By destroying one of their Characters in Offensive Position. Let's say that all four of the above Characters are in Offensive Position. It's the left player's turn to attack, and so Bill is sent to attack Captain Placeholder. Since Bill has 5 OFF Power and the Captain has 4 OFF Power, the Captain is destroyed. 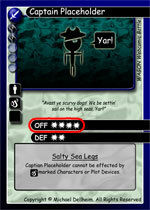 Destroying Captain Placeholder creates an Attack of Opportunity for the left player. 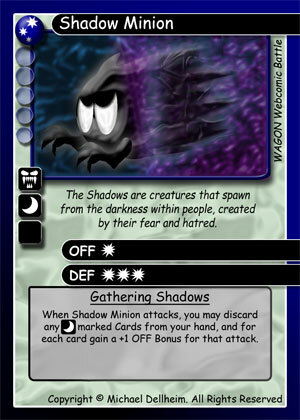 Normally our Shadow Minion, with only 1 OFF Power, would be blocked by Cabin Boy and his 3 OFF Power, but since he has an Attack of Opportunity the Shadow Minion can ignore Cabin Boy and attack a Life Panel directly and destroy it. As long as they are in Offensive Position, even the weakest Character is able to make an Attack of Opportunity, so be aware of the possiblities for yourself or for what your opponent may be planning. Note: Destroyed Life Panels are not discarded, they are added into their owner's hand. This turns a step towards losing the game into a potential advantage in the form of an extra card that can help you bounce back from the attack. This time, if Captain Placeholder (now DEF Power 2) is in Defensive Position and Bill (OFF Power 5) attacks him again. The Captain will still be destroyed, but he will not create an Attack of Opportunity. Of course since Bill could have attacked Cabin Boy to get an Attack of Opportunity from destroying him instead, so we've put him in Defensive Position for this example too. While Captain Placeholder is still destroyed, no Attack of Opportunity was created. So with a sacrifice of one of your defenders you've prevented a sneaky Attack on your Life Panels. Now the Shadow Minion still could be used to attack Cabin Boy instead, but since Shadow Minion's OFF Power is only 1 and Cabin Boy's DEF Power is 2, he's too strong to be beaten by the little guy. With Cabin Boy remaining on the field, your Life Panels are protected from being attacked directly for the moment as well. This is a prime example of why any card in Defensive Position, even a weak one, is better than none at all. Always try to have at least one Defender on the field at all times, just in case.